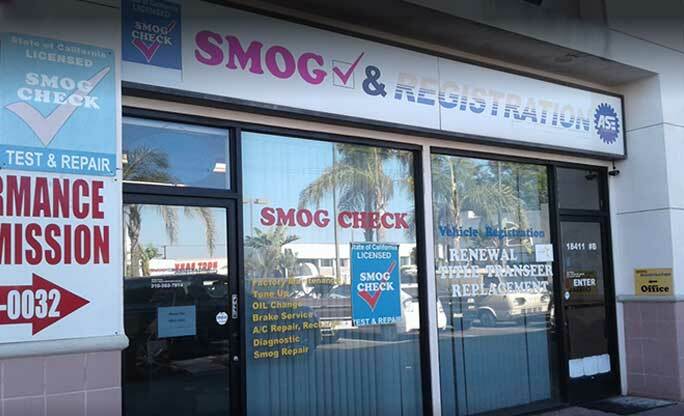 For over a decade, Smog And Registration has provided Torrance area drivers with a one-stop vehicle service solution. From smog tests to oil changes to brakes to registration, we do it all! Our auto repair shop is a Star Smog Check Station, and our mechanics are trained, equipped, and qualified to perform all types of general auto repairs on all types of vehicles, both import and domestic. So, if you live the Torrance-Redondo area, count on us at Smog And Registration for all your car service needs. We’re building trust one vehicle at a time! At Smog & Registration, we get—and keep—drivers on the road! We do it all at Smog & Registration! Whatever you drive, whatever you need, our experienced mechanics are ready to help, from performing a quick oil change to conducting a thorough diagnostic to handling your vehicle registration. Along with complete auto repairs and convenient smog testing, we are committed to providing excellent customer service, which means we’ll take the time to understand your concerns and clearly explain the automotive services we recommend for your vehicle. You can count on us for honest car care advice and fair prices based on the quality of our work. Call Smog & Registration Any Time You Need Auto Service! And much more—check out all our services for cars, trucks, and SUVs! At Smog And Registration, we are committed to achieving 100% customer satisfaction. We offer coffee, refreshments, and free Wi-Fi in our waiting area, and we’re open Saturdays from 9AM until 3PM. Our facility is equipped with up-to-date tools and equipment, and when we need to upgrade, we do, so you never need to worry you’re missing something by bringing your car to a local auto repair shop instead of a dealership. Rather, you’re gaining excellent customer service! Our auto repair and smog check facility is located at 18411 Hawthorne Blvd. in Torrance, CA, between Artesia Boulevard and 190th Street, near South Bay Galleria Mall and only two miles from Redondo Beach. With our high-traffic, convenient location, we serve the entire South Bay area, including Alondra Park. There’s never a dull moment in such a busy and fun neighborhood, but we work hard to ensure everyone who visits our shop feels well cared for, despite the hustle and bustle. If you’re looking for an auto repair shop you can trust in the Torrance-Redondo Beach area, look no further than Smog And Registration… we do it all! Serving Torrance, CA and surrounding areas, including Alondra Park, and South Bay Area.